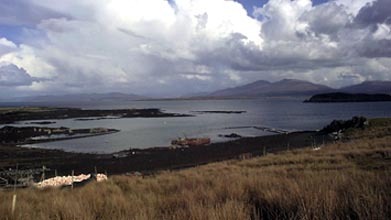 Scalpay is to be found off the north east coast of Skye and is a relatively large island covering some 10 square miles. 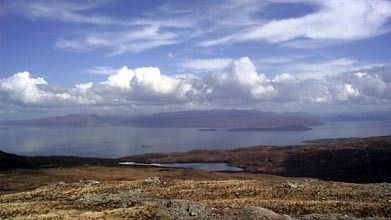 The highest point on the island is Mullach na Carn which rises to a height of 400m. In 1773 Dr Johnson wanted to buy the island of Scalpay to establish a school and an Episcopal church. However, on hearing that an obligation of ownership was that the good Dr would have to had spent at least three months a year on the island soon had him looking elsewhere. In the 19th century Sir Donald Currie constructed the first roads and planted trees. The main inhabitants of Scalpay these days are the Red Deer which are farmed by the islands owners. The heather covered hillsides of Scalpay are protected by Skye from the wettest winds and so make for good walking territory. Scalpay also offers good camping and fishing but it's important to always get permission from Scalpay House. ​None available to my knowledge with any great content about Scalpay. This is not an island which seems to have merited much space in the history of our country. As ever please contact Lonely-Isles if you know of any books you think would be of interest and we'll add them to the site. Isle Of Scalpay - Excellent "Official" site for Scalpay which includes amongst other things details of three cottages you can let during the holiday season. Scalpay Woodturner - Website for a small woodcraft workshop and studio on Scalpay.